When you're building your business around relationships, there's a pretty good chance good beer will fit into the equation somehow. That's exactly the case at Killer Burger, a locally-owned burger outfit that has grown from one to four locations since launching in 2010. 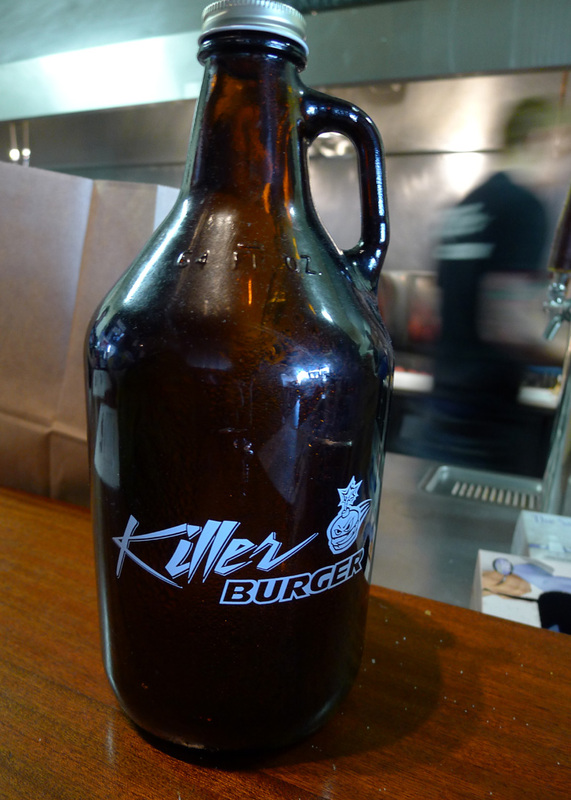 Killer Burger is an interesting and instructive contrast to the brewpub arrangement. They were determined to build relationships with customers by producing great burgers. Beer came into the picture as a means of building even greater passion for the KB brand. With brewpubs, the scenario is generally reversed, with beer being first. Today, the four Killer Burger locations all sport a selection of craft beers. The number varies by location. Hollywood and Sellwood each have five taps; Bingen has 12; Vancouver 10. The selection is determined by a Beer Manager at each location. Seriously. Killer Beer Managers have the enviable responsibility of working with distributors and brewers to determine the best selection of beers for their location. This is an arduous task, often requiring extensive tasting and evaluation. Fortunately, someone has to do this difficult work, which also happens to be a lot of fun. I can't speak for all the locations, but the original Hollywood Killer Burger has a nice tap selection. Beers include Double Mountain Kolsch, two Ninkasi beers, Terminal Gravity Fest and the house brew, Bloodshed Red. This in what is billed primarily as a burger joint. 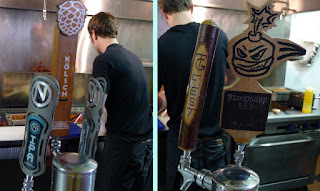 If you're wondering, Bloodshed Red is brewed from a recipe developed by Killer Burger and currently brewed for them by Sasquatch Brewing in Southwest Portland. The beer is a medium bodied red ale that clocks in at 5.8% ABV. Yep, it goes well with most burgers. Just to emphasize the point that beer is an important part of the deal here, they offer growlers and growler fills. Post-shift beers are also part of the plan for Killer Crew members here. They even like the idea of an eventual location that houses a brewery, though they say it likely wouldn't resemble a pub. Did I mention the great burgers? These are old fashioned burgers you won't find in any fast food chain or brewpub. They seriously have the burger thing down. Every Killer burger is 1/3 pound of 100% ground beef and comes with fries and all the trimmings. The business itself is owned by two couples...Mark and Robin McCrary and TJ and April Southard. 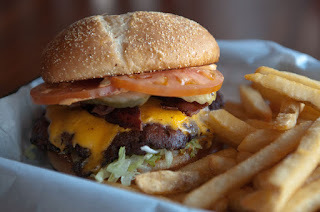 The idea to start Killer Burger occurred to them while Mark and TJ were eating burgers made with roasted Pueblo chilies (that burger is on the the menu today as the Jose Mendoza). Mark and TJ had prior food service experience and decided it might be a good idea to open a restaurant. 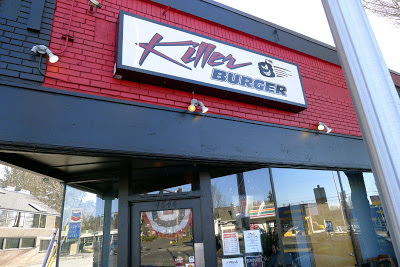 Although Killer Burger has been on a fast growth trajectory for a family-owned business and more locations are likely, they will expand only as fast as infrastructure allows. They like to promote store managers and leaders from within, and they place a high value on the team concept. Anyone who appreciates classic burgers and good beer will enjoy Killer Burger. This place is also a fine example of the continuing expansion of craft beer into places where you once wouldn't expect to find it. I suspect Sellwood is similar to Hollywood...decent tap lists in both locations. More options would be nice, but space is probably the main challenge...both places are small. I love this place. Sellwood is closest to me and It's nice to have a place that has awesome burgers, great beer and amazing staff in a down to earth atmosphere.